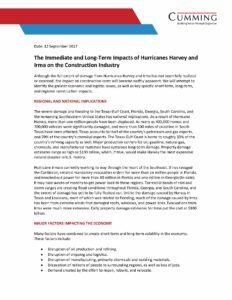 Although the full extent of damage from Hurricanes Harvey and Irma has not been fully realized or assessed, the impact on construction costs will become swiftly apparent. We will attempt to identify the greater economic and logistic issues, as well as key specific short-term, long-term, and regional construction impacts. The severe damage and flooding to the Texas Gulf Coast, Florida, Georgia, South Carolina, and the remaining Southeastern United States has national implications. As a result of Hurricane Harvey, more than one million people have been displaced. As many as 400,000 homes and 700,000 vehicles were significantly damaged, and more than 300 miles of coastline in South Texas have been affected. Texas accounts for half of the country’s petroleum and gas exports, and 20% of the country’s chemical exports. The Texas Gulf Coast is home to roughly 30% of the country’s refining capacity as well. Major production centers for oil, gasoline, natural gas, chemicals, and manufactured materials have sustained long-term damage. Property damage estimates range as high as $190 billion, which, if true, would make Harvey the most expensive natural disaster in U.S. history. Hurricane Irma is currently working its way through the heart of the Southeast. It has ravaged the Caribbean, created mandatory evacuation orders for more than six million people in Florida, and knocked out power for more than 10 million in Florida and one million in Georgia (to date). It may take weeks or months to get power back to these regions. Torrential bands of rain and storm surges are creating flood conditions throughout Florida, Georgia, and South Carolina, and the extent of damage has yet to be fully fleshed out. Unlike the damage caused by Harvey in Texas and Louisiana, most of which was related to flooding, much of the damage caused by Irma has been from extreme winds that damaged roofs, windows, and power lines. Evacuations from Irma were much more extensive. Early property damage estimates for Irma put the cost at $100 billion. Disruption of oil production and refining. Disruption of shipping and logistics. Disruption of manufacturing, primarily chemicals and building materials. Dislocation of millions of people to surrounding regions, as well as loss of jobs. Demand created by the effort to repair, rebuild, and relocate. These factors can be broken down in to two categories: disruption and demand. The disruptive elements are creating a loss of manufacturing, energy, and logistic/shipping capacity, and will have an immediate impact on the U.S. economy. Not only will there be volatility in energy and materials (see below), but the shock to the economy is expected to reduce the growth of GDP as well. Goldman Sachs reduced their Q3 GDP estimate by 0.8% to 2.0%. However, the most disruptive element is the cost of energy. Every single manufacturer, shipper, contractor, and consumer is affected by this sector. In terms of demand, the items most impacted by the repair and rebuild effort will be sheathing and roofing products, as the effort to protect partially damaged structures begins. The remaining demand-related impacts will trail by a period of 12 to 18 months, following the timeline of the flood recovery efforts. Historically, rebuild projects from natural disasters have been slow to materialize. Depending on how many evacuees return to their original homes, the home building industry could feel definite pressure to build new housing and infrastructure throughout the South and Southeast, not just in Florida, Georgia, and the Texas Gulf Coast. This will take a number of years to accomplish. Fuel and energy — The cost of energy affects every aspect of construction, from production and shipping to installation and labor mobility. The volatility in the price of oil and natural gas will have immediate ramifications. The Texas Gulf Coast represents roughly 20% of U.S. oil production capacity and 30% of the nation’s refining capacity. Per the Department of Energy, at least five refineries in the Gulf Coast are operating at reduced rates, which accounts for eight percent of U.S. refining capacity. Six refineries are in the process of restarting, accounting for 12 percent of U.S. refining capacity. Five refineries remain shut down, accounting for six percent of the country’s refining capacity. The restarting process can take several days or weeks, depending on the extent of the damage. The Colonial Pipeline continues to experience a delivery delay of up to a week to Mid-Atlantic states. States along the East Coast can expect gas prices to remain volatile because of already tight supply levels stemming from Harvey, combined with the yet-to-be-known impact of Hurricane Irma. Oil costs have remained relatively flat. West Texas Intermediate is currently at $48.58/barrel, $0.51(-1%) lower than one month ago. Positive news about oil production capacity, as well as a world-wide glut, has helped contain the price volatility for crude oil. However, refining and pipeline constraints has put pressure on gasoline prices. Diesel prices have surged $.20/ga from one month ago nationally, stabilizing at $2.72/ga. The increased cost of transportation and shipping may be passed on to consumers in the form of delivery surcharges. Subcontractors in past disasters have added surcharges ranging from 1% to 4% on products such as steel, lumber, concrete, roofing materials, and piping. Labor availability — Rebuilds following natural disasters have been historically slow to materialize. The nature of the Harvey and Irma disasters will not allow the complete rebuilding effort to fully mobilize for at least eight to twelve months, if not longer. The initial effort to bring power and access to regions of the Southeast, and to clean up the worst water and wind damage, will delay full demand on regional building labor. The Texas Gulf Coast has a construction labor pool of 210,000 workers, many of whom have been displaced by the hurricane. The immediate workforce required for clean-up and repair will absorb much of this displaced labor. The rebuilding of properties and infrastructure will create a demand on the highly mobile regional construction workforce. No one is certain when, and at what pace, this work will materialize. Depending on the timing and level of funding provided by the insurers, private entities, and the federal government, the ramp-up could peak roughly one to two years from now. A more deliberate rebuild could take a decade or more. According to Engineering News-Record (ENR) and Global Insight, Harvey will further tighten an already tight labor market in Houston, which had a 4.9% unemployment rate in July. The initial push will come in trades such as flooring and drywall, followed by demand for higher-skilled workers such as electricians and ironworkers. Expect strong boosts in overtime. However, higher wages may take several years to unfold. Based on studies of Hurricane Katrina, two years passed before a 10% increase in wages for carpenters in the storm area was measured. The damage and impact from Hurricane Irma is still being assessed, but we expect a similar sequence of events. Dimensional Lumber and Sheathing — Prior to the hurricanes, lumber and sheathing prices were steadily climbing because of strong demand and countervailing duties (as much as 20%) on imported Canadian lumber. Canadian producers were getting a temporary reprieve at the end of August, pending a decision from the U.S. Department of Commerce, which is expected to be finalized by November 14th. The market was anticipating a decline in lumber prices nationally; however, the impact of the hurricanes will most likely nullify the decline. Since the hurricane, panic buying and speculation has driven up costs for dimensional lumber, plywood, and oriented strand board. East Texas, Louisiana, and Mississippi generate most of the yellow pine used in this country. Fortunately, most of this region was spared by Harvey. However, we may soon see as much as a 50% price increase for sheathing in the regions affected, due to panic buying and immediate demand to secure and weather-protect existing facilities. Similar price spikes occurred following Hurricanes Katrina and Rita in 2005. Roofing materials — Roofing, visqueen, and sheathing are the three items that are in highest demand following natural disasters, as facilities are closed in to protect from future weather damage. Immediate demand will have great impacts on the price for roofing, and the effects will be regional in nature. In addition, many roofing materials are either petroleum- or cement-based, and will be price-volatile due to the cost instability of the raw material components. Per Global Insight, as much as 90% of U.S. production capacity for resins used in other plastic products is either confirmed offline or has the potential to be impacted because of Harvey. Structural and Reinforcing Steel — The port of Houston is the largest importer of steel products into the country. Per ENR and IHS-Markit, the combination of a disruption of imports, lost inventory, and increased demand from rebuilding could check steel prices, which were weakening before the hurricanes. On a positive note, the probability of a tariff on imported steel has greatly subsided. The U.S. Department of Commerce had been investigating under section 232 of the Trade Expansion Act of 1962 to determine whether U.S. imports of steel and aluminum are a perceived threat to national security. Latest research by IHS-Markit believes this tariff will not go through. Expect steel prices to remain stable. PVC products — One of the largest impacts may be to PVC products. As of yesterday, 25% of the U.S. production capacity of PVC was offline, and another 57% has been potentially impacted. Although production is expected to ramp up quickly, impacts to production and distribution will put a crimp in availability nationwide. Upward price pressure will come from additional demand due to the need for infrastructure repair. Compounding this issue is the fact that FEMA-installed temporary housing has historically had high PVC component content. Expect a double-digit price increase for these items in the next three to six months. If you have any questions regarding this report, please call Bill Rodgers at 916-276-4201, or email brodgers@ccorpusa.com.